Thirty years ago, SeaTrek Sailing Adventures pioneered its small vessel cruise operations in Bali, with a vision to provide personalized sea voyages to special destinations and places of astonishing beauty that seem locked in time. With more than a quarter century of adventure sailing, Sea Trek has been opening the Eastern regions of Indonesia to whole generations of travelers from across the globe. The Katharina (above) is a traditional Indonesian “Phinisi” built in 1995 in Kalimantan using the best grades of iron wood . Her slim hull was originally being planned for commercial sailing before we spotted her in the making and fitted her as a cruising vessel. Not only is the Katharina very elegant on the water, she is also fast becoming a classic yacht as very few of these original designs remain. 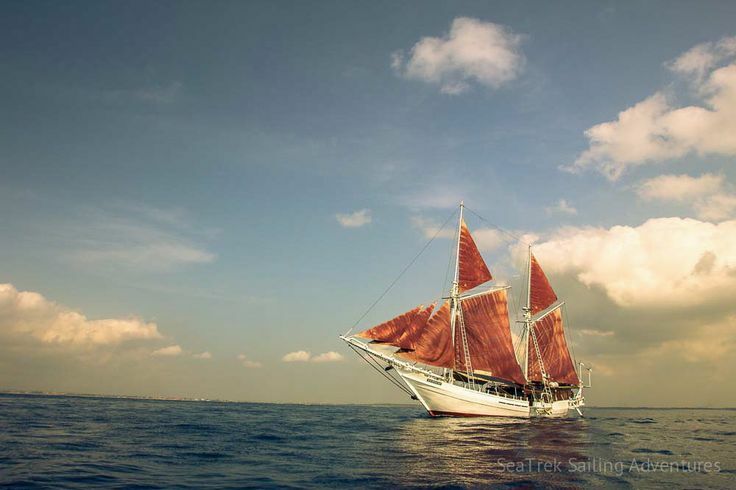 The Ombak Putih is a traditional Indonesian schooner custom built from Iron wood by Buginese ship builders . Her keel was laid in Batulicin Kalimantan in 1995, and she became operational in 1997. The Ombak Putih is 42 meter long, and provides accommodation for up to 24 guests in 12 comfortable cabins.